The title and the illustration below are self-explanatory. At ISO 200 there is a lot of headroom in a D300 file; for this scene it was even more than the 1 stop I set the camera to -- a 1/3 of a stop more before some of the vehicles on the bridge began to clip and 2/3 of a stop before the clouds started to clip. 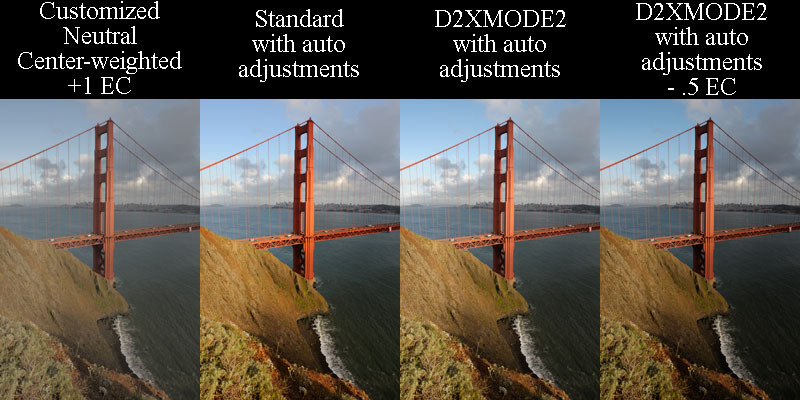 Shooting at ISO 200, +1 EC is the functional equivalent of shooting ISO 100 and results in less noise and squeezes the maximum available DR from the camera's sensor. The problem many encounter with the D300 is that the default Picture Modes apply too much brightness which leads to the impression that the image is being overexposed. This results is a tendency by many to set negative EC, which results in underexposure and is the functional equivalent of shooting at a higher ISO. Tony, that's right. Thom Hogan in his D300 review also complained about the 3 primary picture controls using an overly bright, contrasty tone curve. Fortunately this is adjustable.